September ushers in the arrival of PSL at Starbucks and cyclocross season here in North America! For me it is a really exciting time of year to jump back into the cyclocross season. This year was particularly exciting with a new adventure to Michigan! I arrived to Alma on Sunday afternoon to cooler temps than we were experiencing in Texas. At least the temperatures were in the double digits. After building the new KindHuman Kudus, JB Hancock and I kitted up and headed over to the Alma GP course to get the lay of the land. Situated an hour north of Lansing, Alma is a small town in Central Michigan. Home to Alma College, the town/ city has a small downtown, but offers endless options for riding. 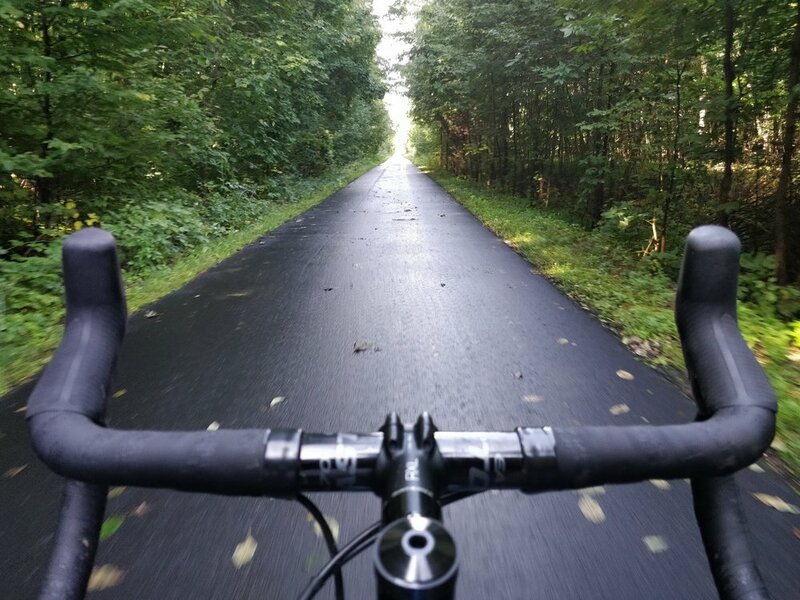 From mountain biking trails and a permanent cyclocross course, to the 40 miles of bike path that start in the city and head out to Greenville, Alma definitely has it going on for cycling! The course is relatively flat, as is most of the surrounding area, but rain early in the week made the ground soft and spongey. We cruised around a bit, checking out the features and the 74-foot-long sandpit that was new for the 2018 edition of the race. Monday Funday is an established practice that JB has created for folks to come out and work on skills and drills at the Alma GP course. On this particular day, I had the great fortune to lead a clinic for the fine folks of Michigan. With people coming from as far as Windsor, Cananda (!! ), it was an awesome event to be a part of! As with any clinic, there was great improvement across the board and we shared a few laughs over some pizza and beers afterwards. I was only in Alma for a day, and it was already shaping up to be a great week! With a solid day of training on Tuesday, I headed down to Ann Arbor on Wednesday with my new chauffeur, and best friend in Michigan, Middy Matthews (of Arbor Move) to meet up with the one and only Mr. David Palan of Bike Shop CX and They Don’t Do That In Europe (TDDTIE) fame. David was a gracious host, introducing me to some of the Ann Arbor Velo Club members and getting a tour of the University of Michigan campus. Thursday we crushed some gravel roads around Ann Arbor (drool) and refueled with some second breakfast at Village Kitchen. After scouting some lines and course changes for the upcoming Veteran’s Park race, it was off to the CX Pre-X Clinic over at Lesley Park. It’s so awesome to see so many folks coming out to practice cyclocross. With well over 50 people in attendance, we took some time to talk about shouldering, remount, and cornering technique before letting loose for a short 20-minute race. Smiles for miles is the only way to describe the rest of the evening! FINALLY, race day had arrived! I enjoyed some Kodiak Cakes in the morning while watching Kate Courtney take home the World Champion stripes in Switzerland (all the feels). Body fueled and fully caffeinated, I rolled over to the course to get the 2018/19 season underway. After a week of 90F temperatures, the weather flipped and ushered in fall temps and blue skies. Although it was a bit chilly, the 50 degree weather provided a nice welcome to the cyclocross season. I arrived at the course and rolled over to the Bike Shop CX tent and trailer to meet Mr. Scotty D, also of Bike Shop CX and TDDTIE fame. Though the skies were blue, the ground was still slick and the course greasy. I set out for a slow recon lap and to share some knowledge with some new friends. With bikes and pressure dialed by Scott, I rolled to the line ready to rip. Nervous, but ready. The whistle blew and I missed my pedal the first time. While a bit frustrating, it provided me the opportunity to not be at the front off the line. I slotted into the group in fifth wheel (better known as “Sven-th wheel”) and surveyed the competition. Who is riding the stairs? Who is ripping the turns? All of these things were coming in and being processed over the first two laps of the race. 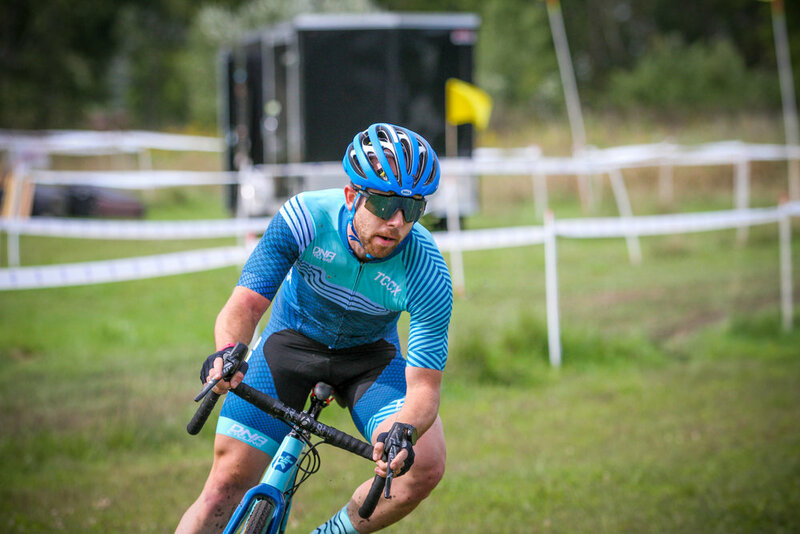 Over the next couple of laps, I put in a few small accelerations to test the legs of the leaders – Jeff Weinert, Judah Gustafson (Speed Merchants), and myself. But each time they seemed up to the task. I would definitely have some work to do if I wanted to win! Three laps in and I was still trying to remain patient in our group of three. Looking back though, I saw Nate Williams (Bissel-ABG-Giant) gaining ground on our leading trio. While I wasn’t certain what Nate’s skill level would be like on the cross course, I was not keen on adding another to our party. Coming onto the start finish stretch, Jeff put in a dig but sat up as Judah stuck to his wheel. Sensing the opportunity, I hit the throttle as hard as I could up the left side of the start/finish stretch. There were still 5 laps to go, but looking back after the first series of turns, I had built an okay sized gap and put my head down to stretch it out farther. I was mashing the pedals and driving the pace as best as I could, but the result I was hoping for would not come easy. Coming into pit two a few laps later, I crested a small ridge that I had already passed a handful of times in practice and in the race. In a moment of inattention, I found myself on the ground, landing on the drive side of the bike. The chain was still on but as I remounted and went to pedal, I realized that it was jammed. No time to think! I ran a quick 20 steps to the pit and grabbed my B-bike from Scotty D.
“Smash & Flow”, I thought to myself. I pushed hard on the pedals on every power section and backed off the gas to carry smooth flowing speed through the technical bits. For all my effort on the bike, I was gaining precious space bit by bit. The lead was not monstrous by any means but it was growing, along with my confidence. With just a few turns left to go, I took a couple of final peaks under my arm to ensure that I had enough time to zip the jersey and cross the line in style. 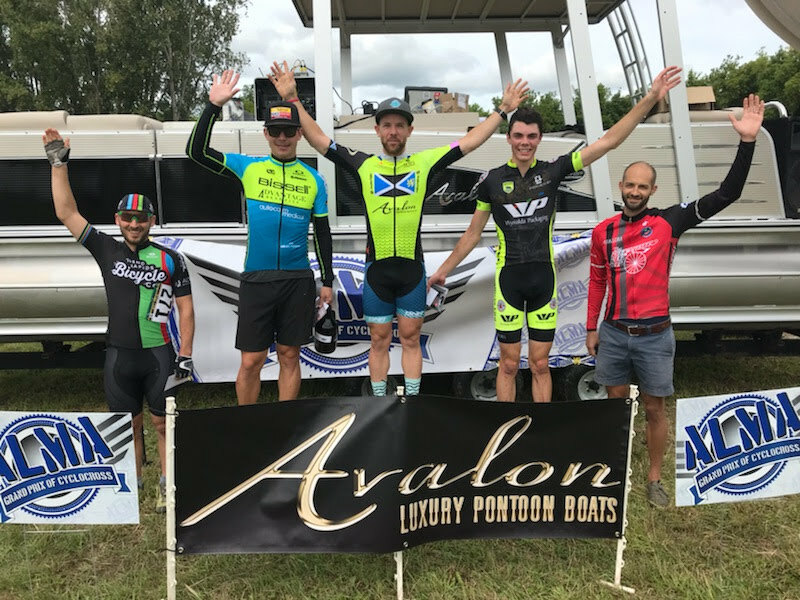 The first win of the 2018 cyclocross season was in the books. After some celebrating on Saturday, it was back to focus on Sunday at Uncle John's Dirty Ride. 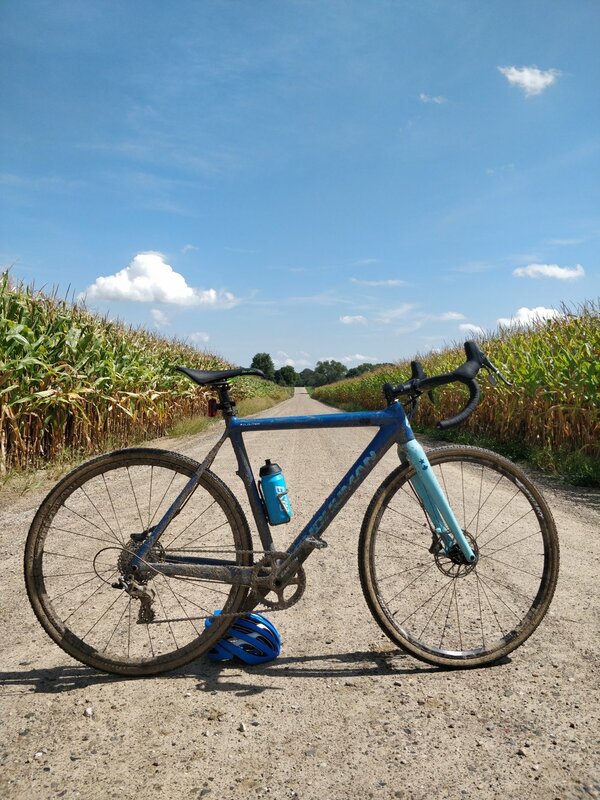 Tracing the gravel roads from Uncle John's Cider Mill, this 55 mile event was pan flat. With strong winds from the North/ Northeast, it almost felt like I was back home in Texas! Fortunately for me, all that time spent in the gutter in Texas road races would serve me well throughout the day. Being that this was my first ever gravel race, I was filled with nervous energy. It's a hard balance at times, being both excited and nervous, especially when approaching an athletic event. One must walk the tight rope between going too hard and being too relaxed to over-compensate for the nerves. As we rolled out on the neutral start, I felt like I was balanced on the line, and confident that I had the motor to stay at the front. The attacks came thick and fast, but I was holding my own in the bunch. Each time I got too close to the front, I would soft pedal on my pull through and find my way to the sheltered side of the bunch. Much to my dismay, no one would really fight me for the space and I was able to save a great deal of energy in the first part of the race. At about the half way point, the group started to thin out. It was at that point that I started to dig my own grave. Pulling through and following attacks, my lack of patience led me to chase moves and try to drive the pace in small groups off the front. But each time it proved to no avail. I ebbed and flowed between Zen-like ease and anxious panic. I wanted to make the race hard, but there were plenty of other racers in the group that had NOT raced on Saturday and were much fresher in the legs. To further complicate matters, I could tell that my front tire was starting to lose air. I began frantically looking at my watch calculating distance and time to determine how much longer the race might be. I pleaded with the gods of cycling and floor pumps that the tube would hold out for just a little while longer. More accelerations came in the closing 10 miles. Dan Korinek, a strong rider in the group, flatted and a few riders noted the misfortune and ratcheted the pace. The lead pack was now 10-12 riders strong, everyone looking at each other to see who would blink first. More attacks and each time I did well to sit and let others cover, waiting until I absolutely had to to jump into the slip stream. With 5 miles to go, I began to recognize the scenery and could see the final (and only) climb to the finish looming in the distance. "You've got no chain today," I coaxed to myself, "Smash them in the final!" One mile to go. A rider took a flyer off the front, gaining only a few seconds off the group. I was quick to react but shuffled myself back to let others pull the lone soloist back to the group. As the bunch closed in, I jumped, going over top and trying to break the elastic others had tried so hard to shell. I thought that if I could be first through the technical turns back into the orchard, I could gain myself a little bit of daylight and hold off the bunch. Unfortunately, my legs were not on the same page as my mind. As I pushed on the pedals, the body started to fail, and I was left with grit to keep driving the pace. Two riders came around me before the chicane. The second blew the turn and the first didn't seem to navigate them as easily. I avoided any mishaps and bit my tongue as I tried in desperation to reel in the last attacker. We turned onto the pavement and I stood up to put in one final dig, but it was no use. My legs were cooked and four riders came around me before I crossed the line in 6th. As I laid on the ground, staring up at the blue sky, gulping in oxygen as fast as I could, I was frustrated. In my head, I knew I had the goods to come up with the win, but on that day I was out ridden by the competition and had to settle for 6th. I allowed myself 5 minutes to be angry and frustrated, and once that time was up, I closed that door in my mind and turned my focus to enjoying the rest of the afternoon. There I was, in rural Michigan on a beautiful early Fall day with the sun shining and new friends to mingle with. Life is good and it will only get better from here! Special thank yous to Scott Dedenbach for being there before, during, and after the race! Having a mechanic there for you, especially one as accomplished as Scott, allowed me to focus on my race and less about my equipment. Thank you to Mr. David Palan, Scot Herrmann, and JB & Kristie Hancock for their hospitality, encouragement, shoutouts, and friendship! It means a lot to me. 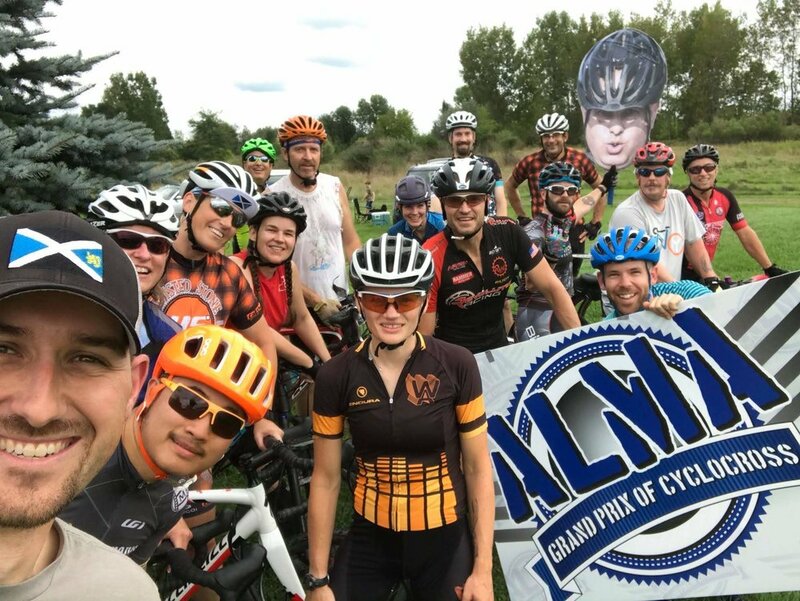 And finally, thank you to the Michigan cyclocross community! I enjoyed my time in the Mitten and I can't wait to see everyone again soon at the races. Tomorrow we're off to Pennsylvania for the Nittany Lion Cross in T-Town!